We’ve entered a slow period for home video because, for the second week in a row, only one major theatrical release is making its way to the small screen. The good news? That one release was a huge hit in theaters. Most R-rated comedies are targeted squarely at guys, but “Bridesmaids” turned that trend on its head. Produced by Judd Apatow and directed by Paul Feig, the movie is essentially a female variation on the formula that Apatow has been delivering for years. It blends gross-out gags with genuinely touching moments, just like “Knocked Up” and “The 40 Year Old Virgin” before it. 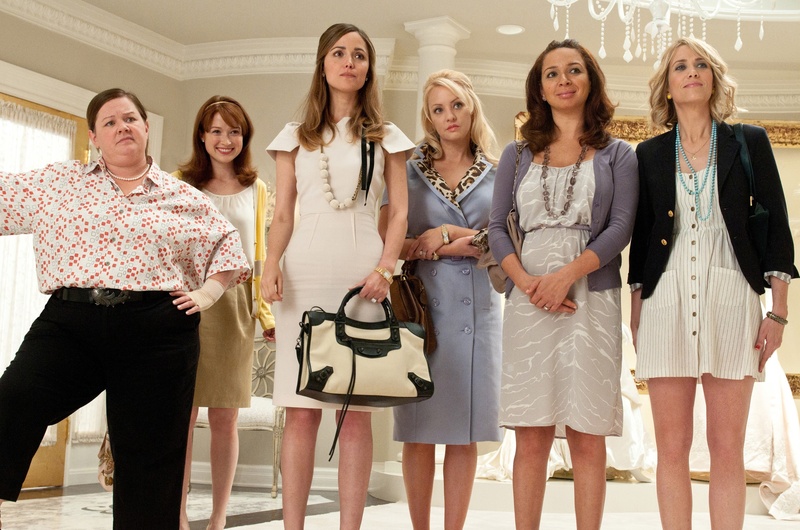 In other words, the only thing new about “Bridesmaids” is the largely female cast. The film stars Kristen Wiig as Annie, a thirty-something Milwaukee woman who is trying to put her life back together after the failure of her small bakery. Her professional woes are compounded by problems of the romantic sort. Her boyfriend dumped her, she sleeps with a self-absorbed jerk with no interest in commitment (Jon Hamm) and her new job involves selling jewelry to happy couples. You can imagine how that works out. Adding to the misery is the fact that her long-time best friend, Lillian (Maya Rudolph), has enlisted Annie as maid of honor for her wedding. Because Annie’s a good person, she wants to support her friend, but she has a lot going on in her life. That makes it tough when fellow bridesmaid Helen (Rose Byrne) tries to take over the wedding. In Annie’s eyes, Helen is everything she’s not: elegant, beautiful and astoundingly wealthy. Interestingly enough, Helen is jealous of Annie, coveting the deep, long-time bond she has with Lillian. That jealousy, of course, sets the scene for an ongoing feud that plays out amongst the company of three other bridesmaids, each with quirks of their own. That group includes Rita (Wendi McLendon-Covey), a burned out wife and mother; Megan (Melissa McCarthy), Lillian’s masculine future sister-in-law; and Becca (Ellie Kemper), a naïve newlywed. The cast is solid and Feig does a reasonably good job moving his players from one gag to the next, and there are quite a few that hit home. Alas, movies about petty jealousy wear thin quickly, and that’s exactly what “Bridesmaids” does every time a joke dies down. DVD and Blu-ray extras include a gag reel, an unrated cut of the film, a collection of deleted and extended scenes and an audio commentary featuring Wiig, Rudolph, Feig and other filmmakers. “Set Up”: Direct-to-video thriller starring Curtis “50 Cent” Jackson as a diamond thief who seeks revenge when one of his friends double crosses him. Bruce Willis, Ryan Phillippe and Randy Couture also star. Co-written and directed by Mike Gunther. “51”: Released in theaters as part of Lionsgate’s After Dark Originals series, this science-fiction horror film is set in Nevada’s Area 51. Because of public pressure, the Air Force decides to allow two high-profile journalists into area. What they find is horrifying. “Body of Proof” – The Complete First Season: ABC Studios is releasing the first nine episodes of this crime drama starring Dana Delaney as a neurosurgeon who has reinvented herself as a medical examiner. “Hawaii Five-0” – The First Season: This re-imagining of the 1960s and ’70s police drama has been renewed for a second season, but fans can relive the first 24 episodes right now. Alex O’Loughlin stars as Steve McGarrett, the commander of an elite law enforcement squad charged with stopping crime on the Hawaiian Islands. “Mike & Molly” – The Complete First Season: Melissa McCarthy is not only one of the leading ladies in “Bridesmaids,” she’s co-star of this CBS comedy about a couple who connect at an Overeaters Anonymous meeting. Billy Gardell also stars. “Raising Hope” – The Complete First Season: First 22 episodes of the Fox comedy about a 23-year-old raising the baby he conceived during an ill-advised one-night stand. Lucas Neff, Martha Plimpton, Garret Dillahunt, Shannon Woodward and Cloris Leachman star. “Dumbo”: In celebration of the 70th anniversary of this animated classic, Disney is rolling the film onto Blu-ray for the first time. That means a terrific high-definition picture, plus extras that include a deleted scene and deleted song. If you’re yet to switch to Blu-ray, Disney is also delivering a DVD-only version and making the film available for download. “Mickey Spillane’s Mike Hammer” – The Complete Series: All 78 episodes of the 1950s crime drama about a New York private detective with a penchant for taking the law into his own hands. “Le beau Serge” and “Les cousins”: The Criterion Collection is serving up freshly restored versions of French director Claude Chabrol’s first two movies. “Le beau Serge” tells the story of a young man (Jean-Claude Brialy) who returns to his hometown to find that one of his close childhood friends (Gerard Blain) has become a bitter alcoholic. “Les cousins” focuses on a provincial boy who moves in with his more-worldly cousin in Paris. Both releases come with several extra features, including audio commentaries by film scholars. “Mad” – Season 1, Part 1: First 13 episodes of the animated sketch comedy series based on the humor of Mad Magazine. The show, which airs on Cartoon Network, features everything from crazy commercials to parodies of popular TV shows and movies. “Castle” – The Complete Third Season: Fans can dip into another batch of shows about a mystery novelist (Nathan Fillion) who teams with a New York Police detective (Stana Katic) to solve crimes. “Modern Family” – The Complete Second Season: More episodes from the Emmy-winning comedy series about a quirky Los Angeles family. Ed O’Neill, Sofia Vergara, Julie Bowen,Ty Burrell and Jesse Tyler-Ferguson star. “The Inspector General”: Shout Factory is offering a new, Collector’s Edition DVD of the 1949 Danny Kaye musical comedy. In the film, Kaye plays a gypsy who wanders into a small town and is mistaken for the powerful Inspector General.